If you have been looking for a iOS game where you rescue llamas on your snowboard then today is your lucky day. 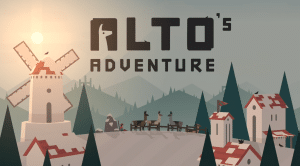 Alto’s Adventure is an endless snowboarding game. 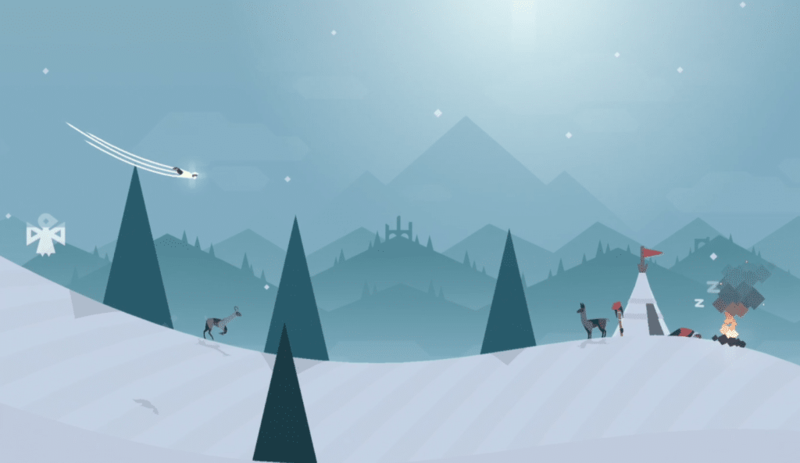 It’s like an endless runner but you’re on a snowboard instead. You see how far you can go before you crash. Sounds easy enough right? If something is in your way, you tap the screen and jump over it. Well it’s harder than it seems because some of the obstacles require a speed boost to clear. The way to get speed boosts is by doing a trick. If you touch the screen and hold it instead of just tapping it, you will do a backflip. You can get speed boosts by back flip or jumping up onto the long ropes above the slope and grinding along the buntings or even bouncing off the top of a rock. 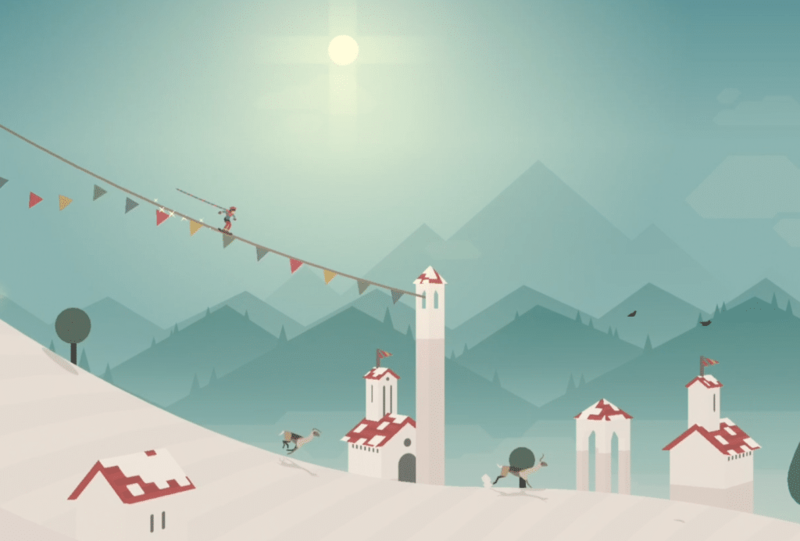 What sets this game apart is the beautiful but simple graphics and great music. Hats off to the artists on this one. The llamas are part of the backstory of your character. You’re a llama herder and your llamas are trying to run away. I guess they aren’t fond of you and they’re willing to risk running down a mountain to escape. You “rescue” them by snowboarding past them. After you do, the llamas slow down and presumable go back up the hill. The story isn’t important, just remember to go past the llamas and do tricks along the way. And to make it even more interesting the game has goals for you to achieve and that will level up your character. The goals are things like do a back flip, bounce off a rock, escape an elder back flip over a campfire. As you collect points there’s a shop for you to buy a few power up items. Definitely be sure to pick up the wing suit when you can. It’s loads of fun. Different tricks are worth different points. Stringing together a few tricks in a row will get your more points. Bounce off of a rock and land on the rope. Do a backflip off of a hill and then bounce off the top of a rock. You get the idea. Every once in a while you’ll snowboard past an Elder. I guess he’s called the Elder because he has a big beard but he’s just this guy camping out on the mountain. When you snowboard past him I think you interrupt the private time he’s having with his llama and that makes him mad. I don’t blame him because when someone snowboards past me when I’m trying to have some private time with my llama I get pissed too. Well this Elder will chase you and if he catches you the game is over. You can only escape him by crossing a chasm. And you stay ahead of him by doing more tricks and getting speed boosts. When one of your goals is the dreaded triple back flip, you definitely need to use Maya. Maya is the best flipper and she can pretty much do a full flip from the smallest of hills. Here’s a video of me completing two triple back flips in one run. That’s a goal for a later level. Not sure which one it was but I was stuck there for a long time. Give Alto’s Adventure a try, you won’t be disappointed.